An evil army to fight. A demon to slay. A world to save. … No pressure! 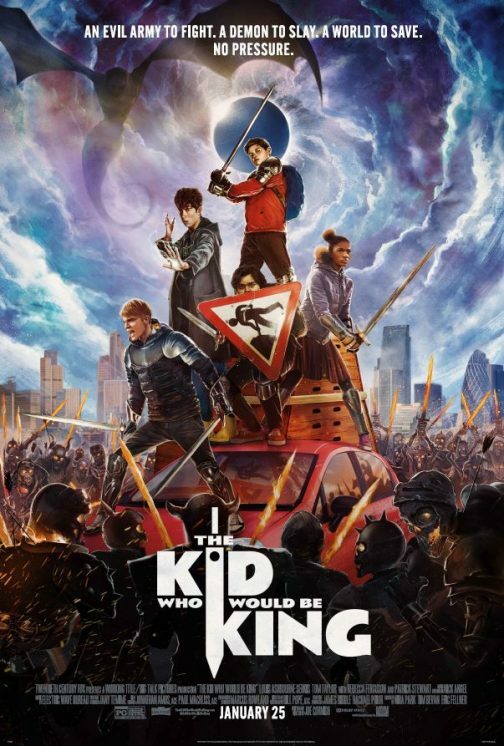 While you could easily pack the family up and see The Kid Who Would Be King when it opens in theaters on January 25, wouldn’t you rather see it for free with us before it comes out? Click here for the chance to attend a special advance screening being held in salt Lake City on Saturday, January 19 at 10AM! Passes admit two and must be exchanged for actual tickets. The theater is overbooked to ensure it fills, so please arrive early and we’ll see you there! Synopsis: Old school magic meets the modern world in the epic adventure The Kid Who Would Be King. Alex (Ashbourne Serkis) thinks he’s just another nobody, until he stumbles upon the mythical Sword in the Stone, Excalibur. Now, he must unite his friends and enemies into a band of knights and, together with the legendary wizard Merlin (Patrick Stewart), take on the wicked enchantress Morgana (Rebecca Ferguson). With the future at stake, Alex must become the great leader he never dreamed he could be.